Recent deep learning models achieve impressive results on 3D scene analysis tasks by operating directly on unstructured point clouds. A lot of progress was made in the field of object classification and semantic segmentation. However, the task of instance segmentation is less explored. 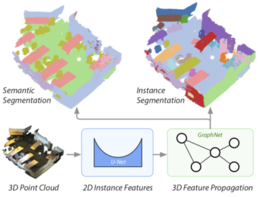 In this work, we present 3D-BEVIS, a deep learning framework for 3D semantic instance segmentation on point clouds. Following the idea of previous proposal-free instance segmentation approaches, our model learns a feature embedding and groups the obtained feature space into semantic instances. Current point-based methods scale linearly with the number of points by processing local sub-parts of a scene individually. However, to perform instance segmentation by clustering, globally consistent features are required. Therefore, we propose to combine local point geometry with global context information from an intermediate bird's-eye view representation. 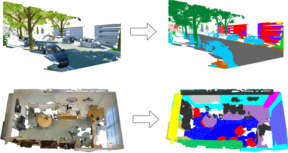 In this paper, we present a deep learning architecture which addresses the problem of 3D semantic segmentation of unstructured point clouds. Compared to previous work, we introduce grouping techniques which define point neighborhoods in the initial world space and the learned feature space. Neighborhoods are important as they allow to compute local or global point features depending on the spatial extend of the neighborhood. Additionally, we incorporate dedicated loss functions to further structure the learned point feature space: the pairwise distance loss and the centroid loss. 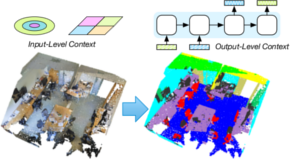 We show how to apply these mechanisms to the task of 3D semantic segmentation of point clouds and report state-of-the-art performance on indoor and outdoor datasets. 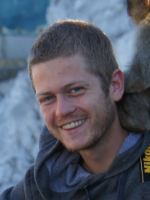 Complementing images with inertial measurements has become one of the most popular approaches to achieve highly accurate and robust real-time camera pose tracking. In this paper, we present a keyframe-based approach to visual-inertial simultaneous localization and mapping (SLAM) for monocular and stereo cameras. Our method is based on a real-time capable visual-inertial odometry method that provides locally consistent trajectory and map estimates. We achieve global consistency in the estimate through online loop-closing and non-linear optimization. Furthermore, our approach supports relocalization in a map that has been previously obtained and allows for continued SLAM operation. We evaluate our approach in terms of accuracy, relocalization capability and run-time efficiency on public benchmark datasets and on newly recorded sequences. We demonstrate state-of-the-art performance of our approach towards a visual-inertial odometry method in recovering the trajectory of the camera. 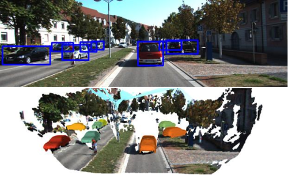 Inferring the pose and shape of vehicles in 3D from a movable platform still remains a challenging task due to the projective sensing principle of cameras, difficult surface properties, e.g. reflections or transparency, and illumination changes between images. 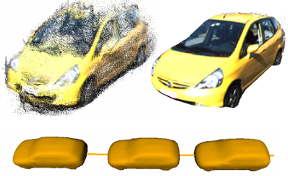 In this paper, we propose to use 3D shape and motion priors to regularize the estimation of the trajectory and the shape of vehicles in sequences of stereo images. We represent shapes by 3D signed distance functions and embed them in a low-dimensional manifold. Our optimization method allows for imposing a common shape across all image observations along an object track. We employ a motion model to regularize the trajectory to plausible object motions. We evaluate our method on the KITTI dataset and show state-of-the-art results in terms of shape reconstruction and pose estimation accuracy. 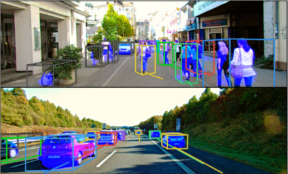 Most vision based systems for object tracking in urban environments focus on a limited number of important object categories such as cars or pedestrians, for which powerful detectors are available. However, practical driving scenarios contain many additional objects of interest, for which suitable detectors either do not yet exist or would be cumbersome to obtain. 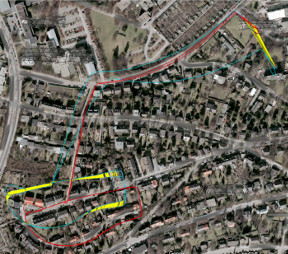 In this paper we propose a more general tracking approach which does not follow the often used tracking-by- detection principle. Instead, we investigate how far we can get by tracking unknown, generic objects in challenging street scenes. As such, we do not restrict ourselves to only tracking the most common categories, but are able to handle a large variety of static and moving objects. We evaluate our approach on the KITTI dataset and show competitive results for the annotated classes, even though we are not restricted to them.